When it comes to file sharing that is. Not anymore when you ingrate SynaMan and Xeams! File size limitations are now a thing of the past when sending emails with large attachments. You will no longer see that annoying error message pop up when sending an email with a file larger than the default size. Ordinary mail servers will reject emails larger than a few. Some occasionally allow administrators to change this value up to 40MB. The reason being, larger emails tend to consume a lot of system resources. With the integration of SynaMan and Xeams, you will now be able to upload and share flies that are 5BG, 10GB, even 50GB or more! The best part of all is the person receiving the email does not need to have Xeams or SynaMan to open these large files. 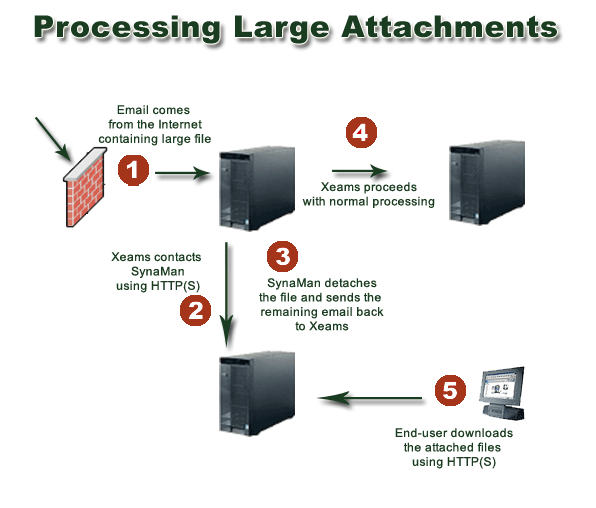 SynaMan uses an embedded SMTP server which accepts emails with large attachments. The STMP server receives the attachment and will remove it if it is larger than the allotted size. The body of the email will be sent to the next STMP server in the chain. The attachment is saved on the host machine where SynaMan has been installed and will created a public link. When the email is opened by the receiver, the public link will be included in the body of the email. From there the attachment can be downloaded from the link. Once Xeams and SynaMan are configured, this same process can be completed in Xeams. Xeams will calculate the size of the attached file and if it is too large to be sent via email, it will be sent to SynaMan. Once the detachment process is done, SynaMan will send the email back to Xeams to be filtered. From there the end user will be able to follow the link created and download the attachment. This solution is great for business, law offices, doctors, individuals looking to share pictures, or anyone needing to share large documents and materials with others. The entire process is done privately! This means no one other than the sender and recipient have access to the public link where the attachments are located.